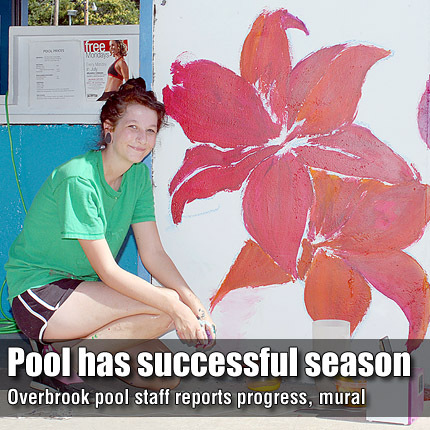 Margot Day, Overbrook, works on a mural at the Overbrook city pool. At the Aug. 10 meeting, Day told the city council she was two weeks from completing the project. OVERBROOK—The Overbrook City Council heard a summary of this year’s swimming pool activity with a positive note. Tammy Luther, pool office manager, presented the council with numbers of this year’s pool activity. Luther first thanked maintenance supervisor Don Bryant for his assistance and support throughout the summer. She said the success of the pool would not have been possible without his help. She presented the council the following information about the number of season and family passes sold, aerobic classes held, swimming lessons, and pool parties, which generated revenue for the pool this year. Luther said the concession stand offered no concessions over $1.50 and the tally for the concessions has not been finalized. Luther told the council that presently the pump is not working and Bryant is working to correct the problem. She also said the chalk supply has been exhausted. Luther asked the council for upgrades for next season such as removing the plastic chairs and replacing them with Adirondack chairs. She said the pool would need to be repainted and a shade area constructed on the inside of the fence would be beneficial. The council didn’t act upon the requests but thanked Luther for another successful season at the pool.